Serviced by a dedicated elevator built for the venue, finally-ready-for-the-public Up sports flourishes as stunning as its unimpeded views of the Chrysler, all spread across a main deck weatherized with a retractable glass ceiling; a bar- & fireplace-abetted open air corner patio with living green walls; an indoor game room complete with projector and luxe standing chess table; and a bathroom fully encased in walnut, making it like a classy Han Solo for pooping. 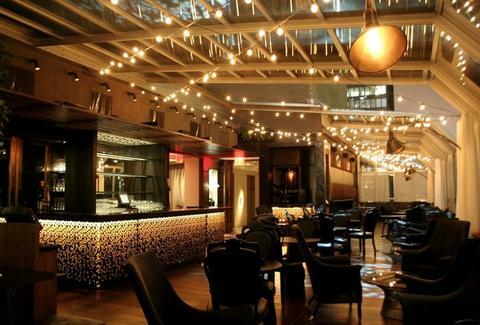 Eye-popping highlights include the main bar, which's topped with blue Belgian marble and wrapped in LED-backlit rubbed bronze lattice work; candle-lit tables surrounded by dark antique smoking chairs; and lighting cast from stainless-steel lamps, elegant strings of incandescent bulbs, and stage lights projecting multicolored patterns intended to evoke twigs in the moonlight (not twigs in the Twilight, as Robert Pattinson is mad litigious). To keep your mind blown, libations include a Sidecar riff w/ Hennessy, Poire Williams, cider, simple syrup, and lemon; the Knob Creek/dry vermouth/Maraschino Midtown Manhattan; the Don Julio Anejo/ Cointreau/ blood orange/ jalapeno juice Morning After; and a mix of cucumber vodka, muddled cukes, and dry sake called the Master Charles, also the British version of Charles in Charge. To grub, there're savory plates of foie gras crostini, crispy baby artichokes, truffled mac & cheese, and beer braised kobe short ribs, whose path to popularity was relatively simple: 1) Get beer, 2) Be short ribs.